Laparoscopic varicocelectomy is contraindicated in patients with recurrent or persistent varix following a retroperitoneal varix ligation. 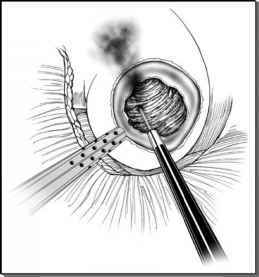 The site of laparoscopic transperitoneal and open retroperitoneal varix ligation is the same. Patients with persistent varix following retroperitoneal ligation should be treated by alternate methods: either transvenous spermatic vein sclerosis or spermatic vein ligation via the inguinal or subinguinal approach (36,37). We have, however, successfully performed salvage laparoscopic varicocelectomy in patients who have undergone failed transvenous or inguinal varix ligation. Previous abdominal surgery is a relative contraindication and risk to intraperitoneal structures but can be minimized with use of the Hasson cannula or the Endopath Optiview®a. Successful laparoscopic varix ligation utilizing the Hasson cannula has been performed in patients who previously have undergone appendectomy, hernia repair, omphalocele, and pyloromyotomy without complication (38,39).